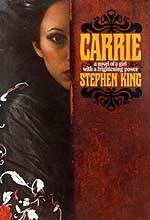 CARRIE starts with blood. And ends with blood. Startling gouts of life-giving/death-dealing blood. And in between – menstruation, high school, and religious dementia. A true horror movie. Director Brian De Palma brings Stephen King’s 1974 debut novel Carrie to the big screen in blood and strawberry blonde: Sissy Spacek as Carrie White, perfectly embodying the awkward teen schoolgirl outcast, Piper Laurie sufficiently deranged as Carrie’s biblically-insane religious Mama; sweet curvaceous Nancy Allen as Bad Girl Chris Hargensen; striking Amy Irving as Good Girl Sue Snell, and angular Betty Buckley as sympathetic gym teacher Miss Collins (changed from Ms. Desjardin in the novel). All blonde. All the time. First period. Bleeding in the shower of the girls’ locker room. Terrified, Carrie cries out for help; we realize she does not understand what menstruation is. Taunted, girls jeering, tampons thrown at her, school principal callous, distraught, Carrie rushes home. We meet Mama, and immediately understand: “Why didn’t you tell me, Mama?” Instead of a sympathetic ear, wild-eyed Mama drags Carrie screaming to The Prayer Closet and locks her in, preaching brimstone for the “sinfulness” of Carrie’s period and that she must pray until forgiven by god. Bloodied Christ on the cross looking down and lending a horror hand. For leading the bullying girls, unrepentant Chris is suspended from school (and the prom – heavens, no! ), so plots to get even with Carrie, enlisting her Sweathog boyfriend to kill a real hog and drain its blood, planting the bucket above the stage at the prom hall. I tell ya, with all the Machiavellian plotting Chris achieves to place Carrie directly under that bucket on prom night, she should be either a politician or a hitman. Unravel one thread and the plot falls to pieces. Thus, the iconic scenes of Carrie onstage during her one moment of joy – drenched in blood. A metaphor that teen girls and the teen guys trying to make them during the wrong phase of the moon are well acquainted with. De Palma splits his screen into comicbook frames, so we can see Carrie’s deathly stare and the results of her telekinetic retaliation simultaneously. With each mental strike, a violin shriek (PSYCHO copyrights be damned!). The school burns. All those who laughed now scream in agony. Because of its revenge premise, CARRIE has always seemed more visceral satisfaction than horror. The horror is Jesus. And Mama’s ungodly love of him. When Carrie stumbles home for solace in the arms of Mama, Jesus just won’t let Mama go, as he whispers in Mama’s ear that the devil in Carrie has to be killed with a big knife to the shoulder blades. Carrie’s last stroke is to crucify Mama with bladed implements. Back in 1976, these beats were not played offhandedly as nowadays they are, to a generation inured to creative one-dimensional violence. Back then, a daughter telekinetically stabbing her mother to death birthed a new horror genre. And we can see the emotional cost of each action on the characters’ faces. Sissy Spacek and Piper Laurie received Academy Award nominations for their performances. And everyone lived blondely every after. Writers: Stephen King, Lawrence D. Cohen. Starring: Sissy Spacek, Piper Laurie, Amy Irving, William Katt, John Travolta, Nancy Allen, Betty Buckley.